Yesterday (February 18), Greg Boswell continued his extraordinary run of routes with the third ascent of The Hurting (XI,11) in Coire an t-Sneachda. 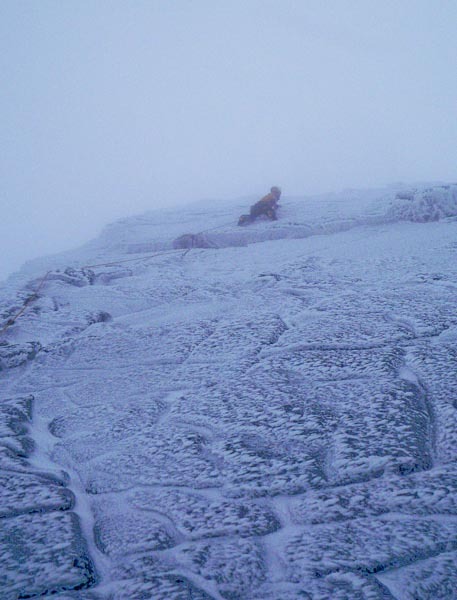 This 35m-long test-piece, was first climbed in winter by by Dave MacLeod in February 2005 and only received its second ascent by Andy Turner last month. Greg first attempted the route last Saturday (February 12). Unfortunately he took a fall when his axe ripped pulling over the roof. Greg then returned on Tuesday (February 15), but conditions were poor with strong winds and blowing spindrift, and he fell off at the top of the steep crack on the headwall, tantalisingly close to the top. “Yesterday I returned [with James Dunn] to find the route very white and again with a very strong wind hitting the wall,” Greg told me. “I could only get half as much gear as on my previous attempts due to the build up of ice in the cracks, which made this the scariest attempt yet. I reached my previous high point with the wind growing stronger with every second that passed. I managed to move quickly past the strenuous moves on the smeary foot placements, to arrive on the less steep top section of the headwall. This is where things got really really scary! I couldn’t find any gear and my last two cams would definitely have ripped out of the icy cracks, that I had shoved them into as I rushed to find better foot holds before my pumped arms gave up. I commented to Greg that just reading his account made my palms sweat. This entry was posted in Repeats and tagged Greg Boswell, James Dunn, Northern Corries. Bookmark the permalink.